Adding a new graphics card to your Alienware notebook to enjoy the latest games can be difficult and costly, but Alienware’s new Graphics Amplifier lets you pair your laptop with a standard desktop-class GPU for a spectacular gaming experience. The Graphics Amplifier is a little like an external hard drive dock, only instead of sticking an HDD inside it, you throw in a graphics card instead. In supports almost all standard cards — so long as they don’t require more than 375 watts of power — so no matter what your budget, it has you covered. The Amplifier then plugs into your computer and boom — you have a top of the line GPU for gaming and other graphically intensive tasks. And of course, whenever you need another upgrade, it’s as simple as swapping out your old card for a new one. 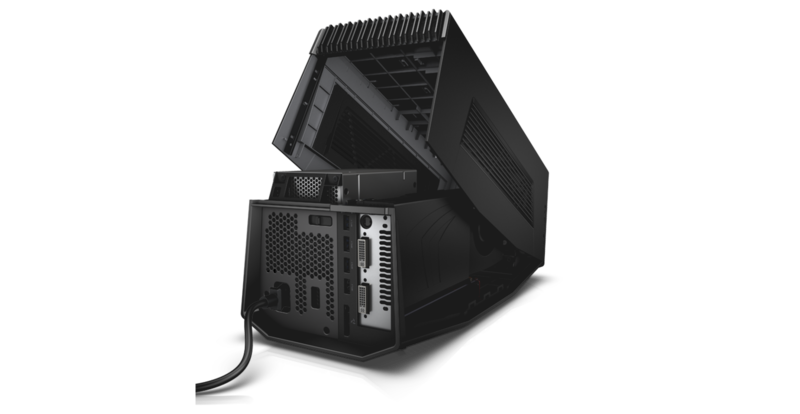 The Amplifier also has four powered USB ports built-in for expanding your computer’s connectivity options, and that cool little Alienware LED on its front is customizable. There is one downside, however — and it’s a big one. The Amplifier uses a propriety PCI-Express-based cable, so it’s currently only compatible with the new Alienware 13 notebook. Future Alienware devices will ship with the same connector, but if you have an older machine, you’re out of luck. That’s a shame, because a device like this is a terrific add-on to any laptop for those who want to play high-end games. What’s more, Alienware would most definitely sell a whole lot more if the Amplifier was compatible with a greater range of devices. Alienware has to give consumers an incentive to buy its latest machines, though, and making the Amplifier available to all could damage sales of its gaming laptops. Perhaps making the device an Alienware exclusive isn’t too surprising, then. If you do have an Alienware 13 and you fancy a new GPU, you can pre-order your Graphics Amplifier today for $299 (without a graphics card) from Dell’s online store by following the source link below.